When the time comes to get windows for your home, where should you go? Two popular options would be replacement window companies that specialize in that specific product category and big box stores that focus on dozens or even hundreds of different product categories. It’s true that you can find quality products at both types of retailer, but there are good reasons why you should get products for your next Beaverton, ON window replacement project at a specialty window replacement company. What follows are some of those reasons. It goes without saying that staff at a store with one or even few products will be better able to learn the ins and outs of those products than will staff at a store with hundreds of products. When you head out in search of new windows, you’ll be best served at a specialty replacement window store if you want to learn about window trends, features, technologies and other things. You’ll be at a disadvantage if you must rely on the information, recommendations and explanations of staff who have no real expert knowledge. In other words, you could be seeking guidance from people whose knowledge base on windows is no better than yours. Yes, big box stores can provide good customer service. But smaller specialty retailers will usually have more time to connect with customers. And this focus can be a great differentiator. You’ve probably been to huge big box stores that were understaffed. It’s hard to get proper customer service in such situations. Smaller stores with specialization will have employees who can help you, and you’re more likely to appreciate the buying experience when you realize that you as a patron are being properly serviced. Buying windows is a big decision, so you want to work with specialty window replacement retailers that can provide customized service and that can spend however much time is needed to help you to make an informed buying decision. Again, you can get great products from specialty window replacement businesses and from big box stores alike, but it can be argued that the overall quality at the former is more than at the latter. For one thing, smaller stores offer a wider range of quality replacement windows and can more quickly respond to changing industry dynamics. On the other hand, it always takes longer for big box stores to respond to emerging trends. As well, the window products at big box stores can range from so-so to great since big box stores typically want to attract buyers by sometimes offering too-good-to-be-true deals for products that are not always of the highest quality. 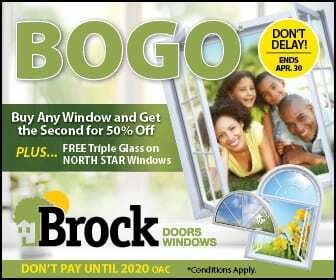 A Brock Doors and Windows Ltd., we definitely advise that you buy windows from a specialty window replacement company over a big box store for the above mentioned reasons. We have you covered if you’re pursuing a Beaverton, ON window replacement project for your home. So get in touch with us at our Whitby office at 1751 Wentworth St Unit 4-6 Whitby, ON L1N 8M2. You can also get a hold of us by phone at (905) 720-3610. We’re here to help.